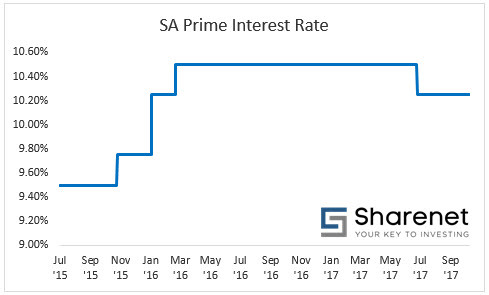 While there has been a general feeling amongst JSE brokers that the worst in interest rate rises is behind us, Nedbank’s latest view is that they will fall from here, which could be a positive sign that the South African economy is on the turn. Nedbank points out: "During its meeting in July the monetary policy committee decided to reduce interest rates by 0,25%. Despite no further rate reduction at their meeting in September, this is widely understood to be the turning point of the interest rate cycle, and further decreases in interest rates are anticipated as a result. This understanding also aligns with the Nedbank economic view, although we cannot predict the exact pace and extent of future interest rate changes. We are informing you of this as it is generally good practice to review your investment portfolio at key inflection points in the economic cycle." Nedbank suggests investors might want to move to a fixed income investment rate if they don’t need access to their cash in the short term. Nedbank recommends two investments, one is Nedbank’s� six-month investment which pays out 7.2 % on R250k +, the other is a 12-month commitment with a minimum of R100, 000k that pays out a return of� 8%. A declining interest rate is what is normally behind bull markets. The stock markets in New York, London and other major financial centres are all hitting new highs. Now, the JSE has a worthwhile reason to follow the signal of these potential bull markets. For a while, Nedbank is spot-on focusing on bonds and their potential rises. But the big and exciting play of falling interest rates is on equities. They are affected by the rates at which they pay on their borrowings. Interest rates coming down generally also make the price of company stocks and materials lower as well. It is hard to find any part of an equity that is not pleasantly surprised by falling interest rates. Let’s hope that the investment brains at Nedbank have got it right. But perhaps as important is the fact that they were quite happy to communicate their investment views to clients, right or wrong. Jeremy Woods trained for three years as a journalist on the Herts Advertiser, St Albans, in the U.K. Once qualified, he left England to work as a crime reporter on the Vancouver Sun in Canada. After three years, he worked for the Los Angeles Times as a trainee financial journalist, spending most of his time reading company accounts and finding publishable stories in them. He moved to South Africa and for the last five years in journalism worked for the Sunday Times, Business Times, as Investment Editor. He has also published a financial thriller called "Special Payments", which was a best-seller on publication, and optioned three times for a film.